See more, taste more, and explore more of authentic, local SF by bike! Enjoy a leisurely, flat, and extra-fun ride while discovering the many layers of essential SF food culture, history, art, and more on a single experience. We'll learn about and taste the "best of" San Francisco's vibrant, diverse, and world famous food culture that defines the creative spirit of our legendary “city within a city”, the Mission District-- by bike. Plus get tons of insight on the neighbors defining mural art and Victorian architecture! You’ll taste an array of the Mission’s best food that has defined SF’s craft and farm-to-table food movements. Along the way, we’ll also explore the parks, shops, and murals that, along with the food, form the Mission’s eclectic and exciting creative ecosystem. 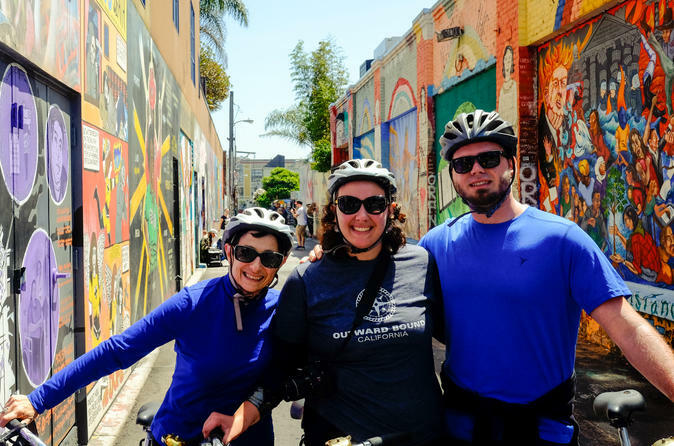 We're San Francisco's ONLY small and independent bike tour company which allows us to proudly offer one-of-a-kind insider's adventures highlighting the very best of local SF! This food-meet-bike tour is an unforgettable in-depth look at San Francisco's distinctive food culture, vibrant street art, and fascinating history. There is no better way to learn and experience the real SF than on this memorable bike & foodie adventure! Learn about the roots of San Francisco history, including a a crash course on Victorian architecture, a fascinating first-hand look at the 1906 earthquake, and a visit to the city’s oldest building at Mission Dolores. Enjoy a stop at SF's favorite local outdoor destination, Dolores Park, featuring stunning panoramic views of the SF city skyline. See SF’s largest mural, an infamous mural alley with the city’s most diverse, highest quality street art, and so much more! The SF food, mural, & history tour is a great ride for almost anyone! Expect a flat bike route and a shorter distance but see so much! We will stop frequently to take in the sights, snack, and hydrate, including extended off the bike explorations. Our tours ride the safest, flattest, and most scenic routes in SF, period. We have the smallest tour group sizes in SF to ensure the safest ride possible.